Change is never easy, especially when you have to change how you work and where you work. Since November 2013, Dr. Richard Gosselin and a team of nurses, physicians and respiratory therapists from both the Royal Victoria Hospital and the Montreal Children’s Hospital Neonatal Intensive Care Units (NICU) have been meeting on a monthly basis to develop an action plan for how to best prepare their staff for the Glen site. 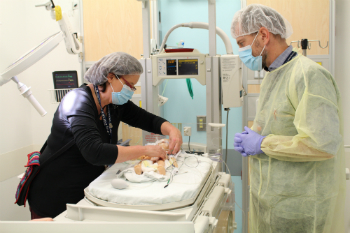 “We decided that the best way to test our new working environment and subsequently train and orient staff would be to simulate a normal workday,” explains Dr. Richard Gosselin, a neonatologist at the Children’s. The planning group then surveyed staff and asked what their biggest concern was about moving to the new NICU at the Glen site. After analyzing the results, the team summarized the main concerns emerging from the various professional groups and developed a blueprint of themes to explore in simulation. One major concern was communication. Namely, in the case of an emergency, how would a staff member call for help? How will the work be divided in such a large space? In covering 52 single-patient rooms, how will staff members communicate with the team at large? Dr. Gosselin and his group then brainstormed on how to use simulation to tackle the main concerns identified in the survey, all while testing out their new work environment, including their workflow. 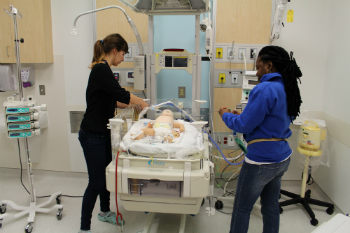 They decided to develop nine different real-life scenarios and test them on NICU early activators during the first phase of their simulation training. Together they could then determine what worked or didn’t work in their new space. It would also give them the opportunity to identify and find solutions to potential problems or hazards before patients and families arrive. 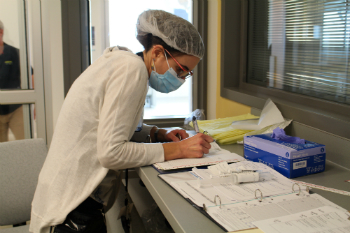 For eight days straight, two one-hour simulation sessions were held a day at the Glen site. Each half-day started with a 30-minute huddle, during which team members received an orientation on the process of simulation and received a “sign-out” on the simulated patients. Each member was assigned a role (corresponding to their usual professional role) and was instructed to act out the scene alongside their colleagues, while one or two members acted as narrators by guiding team members through the various simultaneous scenarios. 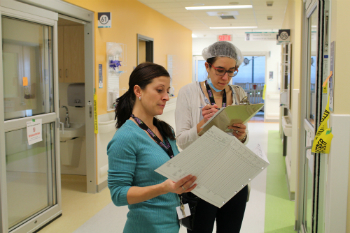 During one afternoon session, Andréane Pharand, the MUHC NICU nursing coordinator, was moderating the simulation and occasionally threw curveballs to see how the team would react. “A very emotional mother is on her way and wants to know why her son is getting a PICC line,” she would say, or, “Your multi-disciplinary committee has just arrived. They don’t know where the conference room is.” Each team member was instructed to take note of issues that arose during the simulation. Each simulation was followed by a two-hour debrief period where each team members’ observations were brought forward for discussion. Following each simulation session, solutions to these issues were also discussed at length.